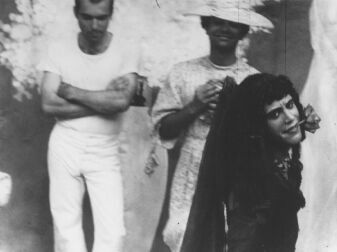 Mario Montez (foreground) and Piero Heliczer (in hat and dress) in Jack Smith's "Flaming Creatures"
Tony Conrad has been a key figure of the New York avant-garde since the early 1960s. He is well-known as a musician for his role (along with John Cale, LaMonte Young and others) in the Dream Syndicate, and as a filmmaker he created 1965's classic "The Flicker." Lesser known is the fact that Conrad played an important role in the creation of works by other filmmakers, some of which are among the most popular and enduring avant-garde films of the 1960s. Frequent Small Meals and Table of the Elements are proud to host Tony Conrad for a unique event at Eyedrum. Conrad will introduce films by Jack Smith, Ron Rice, Piero Heliczer, and Ira Cohen – films in which Conrad appears or for which he did soundtrack work. ** Jack Smith's "Flaming Creatures" is one of the most controversial films ever made. Groundbreaking for its polysexual imagery, it is widely admired today as a prime example of the artistry, humor, and visual brilliance of this visionary director and performer. 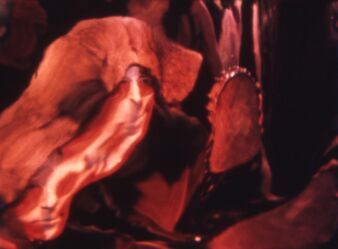 "Flaming Creatures" will be screened in its original format of 16mm, along with Ron Rice’s "Chumlum," a sumptuous pre-psychedelic work from the early 1960s with a typically charismatic Jack Smith performance. ** Like "Chumlum," Ira Cohen's "Invasion of Thunderbolt Pagoda" features a musical score by the legendary percussionist (and Conrad collaborator) Angus MacLise, best known as the original drummer for the Velvet Underground. J. Hoberman of the Village Voice called MacLise’s score a "masterpiece of Tibetan-Moroccan-Druidic trance music [which] truly blossoms in conjunction with the exotic smorgasbord served at Cohen's psychedelicatessen." The evening also features a world-premiere of a new Cohen work, "Brain Damage." ** Piero Heliczer's 1967 "Joan of Arc" features a mesmerizing soundtrack by Conrad. This extremely rare film has not been screened outside of New York in many years and represents one of Conrad’s finest musical performances. Carnivals of Ecstasy is a Film Love event and is part of the Table of the Elements Festival #4. Angus MacLise in Ira Cohen's "Invasion of Thunderbolt Pagoda"